Ours is the known name involved in the manufacturing, exporting and supplying of Anti Vibration Multi Layer Pads that conforms to British Standards, BS 3974: Part. Our Anti Vibration Multi Layer Pads are ideal for such applications where pad type mountings are to be used. 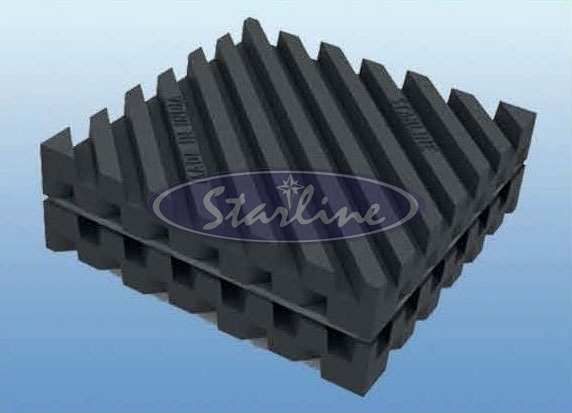 Featuring multiple patterned rubber sheets separated by steel load distribution plates, our Anti Vibration Multi Layer Pads provide better isolation of noise and vibration than single sheet pads. 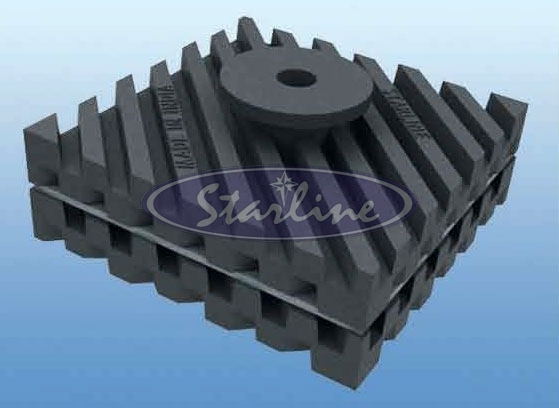 Anti Vibration Multi Layer Pads that we offer are comprised of multiple layers of resilient rubber in series, which permits higher deflection under load than feasible with a single layer. Due to policy of continual improvement, the specifications are subject to change without prior notice. 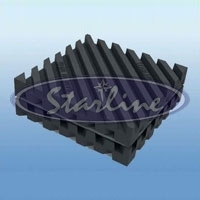 Pad comprises of multiple layers of resilient rubber in series. This permits higher deflection under load than feasible with a single layer. Load distribution plates ensure full pad area is used and give more linear load deflection characteristics. Unique diagonal ribs help to distribute applied load evenly over larger area of pad surface. Alternating raised ribs extend pad load range. Ribs above and below the pad are at right angles to each other, thereby forming non skid surfaces which resist creeping of the equipment. Square cell pattern has a higher load bearing capacity than ribbed. The grid design creates "Suction Pockets" for better grip on equipment / floor surface. The suction pockets make the pad more effective for noise attenuation than ribbed pads. Solid cell periphery extends pad life by preventing ingress of external contaminants. In installations where equipment is bolted to the floor, the bolt must be isolated from the equipment base. 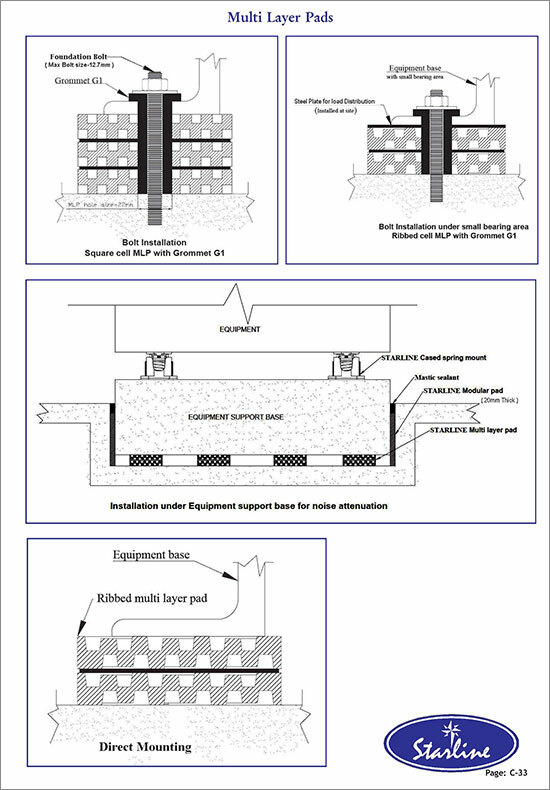 Failure to do so, short circuits the pad and allows travel of noise / vibration to the building structure via the bolt. 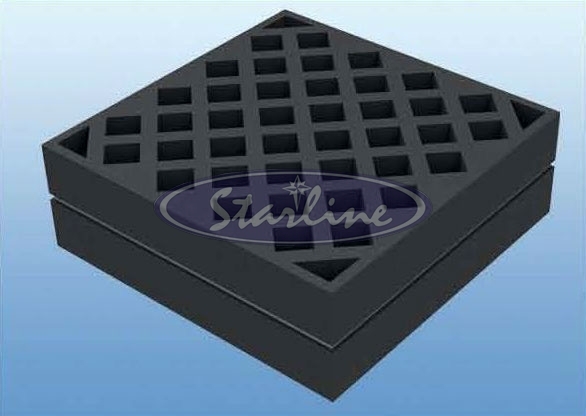 Starline offers the exclusive feature of Multi layer pad with pre drilled central hole and supplied complete with grommet "G1". The grommet breaks physical contact between the bolt and the equipment base, thereby permitting the pad to perform optimally. Options : Both Ribbed and square Cell multi layer pads are available with grommet. Add suffix "G" after model. 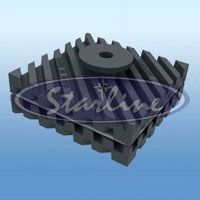 The multi Layer pad should not extend beyond the equipment base by more than 15 mm. Wherever the equipment leg has a very small bearing area, cement a 3 mm thick steel load distribution plate over the pad using rubber based adhesive. 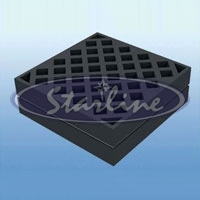 Use starline multi layer pad with grommet "G1" where the equipment needs to be bolted to the floor.